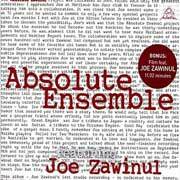 Absolute Zawinul, a collaboration between Joe and Kristjan Järvi’s Absolute Ensemble, has been released in Europe. Recorded in the winter of 2006-2007, Absolute Zawinul is the last formal studio recording that Joe made. The project was initiated by Järvi, who approached Joe with the idea of the ensemble performing some of Joe’s music. They combined for some live performances in the summer of 2006, and later went into the recording studio in New York to record the album. There is a good description of the project on the Schott Music web site, where you can purchase the album. It is also available from Amazon Germany. Included is an eleven-minute video documentary about the making of the album. Obviously this is a must-have for Zawinul fans. No word on when it will be released in the states, but presumably there will be a licensing deal at some point. In November 2007, I interviewed Kristjan Järvi with the idea of posting it to coincide with the release of Absolute Zawinul. Now that it is available in Europe, you can read my interview here. This December, acclaimed saxophonist Steve Wilson will reprise and expand a program of Joe’s 1960s compositions that Wilson performed last year as part of an Austrian jazz/arts festival. The Zawinul Tribute concerts will take place December 17-20 at The Jazz Standard in New York City, and offer a rare chance to hear this music performed live by a top notch group of musicians. The project is an outgrowth of a concert Steve staged last year. “Laura Hartmann, my manager, was the producer of an Austrian jazz/arts festival in NYC last year,” Steve recently told me, “so of course Joe’s music was an immediate consideration. I proposed doing some of his music that was lesser known but definitive of his evolution as a player and composer. With that in mind, the three Zawinul recordings that are the centerpiece are Soulmates (with Ben Webster), Money In The Pocket and Rise and Fall of the Third Stream. “For this time around we will branch out to include ‘In A Silent Way,’ ‘A Remark You Made,’ and perhaps more of his material from Cannonball Adderley, Weather Report, and The Zawinul Syndicate. We will do ’74 Miles Away,’ and ‘Mercy, Mercy, Mercy’ as a set closer. “What’s appealing in performing this music is that it hasn’t been performed and recorded that extensively by other artists, so it’s still fresh and there’s a lot of room for interpretation. And our chosen program is just an example of the wide range of Joe’s musical vision. The performances will feature The Steve Wilson Ensemble with a line-up including Jeremy Pelt, Danny Grissett, Ugonna Okegwo, and Lewis Nash. For more info, visit stevewilsonmusic.com or The Jazz Standard website.